A day in Berlin and as a "souvenier" I brought our new boy Solenzara's Solomon Jack (RAG a 04)! Isla ~ Dollyblues Somebody To Love (RAG f 03) graduated as INTERNATIONAL CHAMPION! Also Isla's mother Lulu ~ Dollyblues Lady Snowflake (RAG g 03) graduted as SUPREME CHAMPION! 7.5.2014 We have new boy! Our new boy Sylvester ~ Of MoonlightDolls Silver Shadow (RAG n 03) has arrived from Holland! Sylvester is again co-owned with Rock'nRags -cattery. 27.2.2014 We have new girl! In addition we competed in 3 generations class with Moritz, Ilona and Onni and placed 3rd! Judge Lone Lund was really happy with our group and development she saw from generation to another "from good cat to great cat to almost perfect cat". Show results from TUROK 23-24.11. Saga ~ Mariamores O'Lala of Adonis (RAG n) was Ex1 (out of 2), BIV, NOM and Best In Show on Saturday and Ex1 (out of 2) on Sunday! Show results from Tallinn 16-17.11. Nala ~ Dollyblues Goin' Bananas (RAG d 04) got sertificates both days and graduated as International Champion on Sunday! Isla ~ Dollyblues Somebody To Love (RAG f 03) Ex1 (cl11) both days. Show results from ERY-SYD 9-10.11. Wow, what a weekend! My beautiful new girl Saga ~ Mariamores O'Lala of Adonis (RAG n) was Ex1 (out of 2), BIV, NOM and Best In Show BOTH DAYS in her first show in Kouvola! Also Nala ~ Dollyblues Goin' Bananas (RAG d 04) graduated as Champion on Saturday and got her first CACIB on Sunday. My new boy has arrived, Lenni ~ Rock'nRags Heart On Fire (RAG a 04) - thank you Niina! We have a new girl: S*Mariamores O'Lala of Adonis. O'Lala will replace our previous female Elli (Mariamores Elaya King Creole), who never got kittens. I picked her up from Sweden today, Friday 13th, 4 flights within 8 hours - what a day;) O'Lala moved directly to the foster home to Lempäälä, where she will live as spoiled baby together with my Mimosa -girl and Nuutti. Nuutti ~ Dollyblues MusicOfMyHeart (RAG n 04 21) graduated as SUPREME CHAMPION! Mimos's sister Miina ~ Dollyblues Hello Mary Lou (RAG a 03) both days BEST IN SHOW female! Wohoo, I have graduated from PawPeds G3 -course! This was the third and so far last section to the international Pawpeds course. By clicking the picture opens a link to course presentation page. Also Onni ~ Dollyblues Be The One (RAG d 03): Ex1 + BIV + NOM, and Pyry ~ Dollyblues Wannabe (RAG n 03) graduated as SUPREME PREMIOR! Also Nala's sister Elli ~ Dollyblues Kookie Kutter (RAG f 04 21) NOM, and Nuutti ~ Dollyblues Music OfMyHeart (RAG n 04 21) graduated as GIC - nice day! 11.12.2011 Our new boy is here! total 10 Dollyblues cat in the show! total 12 Dollyblues cat in the show! 11.9.2011 Sanni International Premior & BEST IN SHOW neuter female!! 4.9.2011 Ilona Grand International Champion! 4.9.2011 Sanni NOMINATED for best in show! 28.8.2011 Ella Best In Variety! New girl DE*Solenzara's La Paloma ~ Luna ~ has arrived! Thank you Birgit! 7.8.2011 We have kittens at home! Enya has got 6 kitten! 4.6.2011 Lulu NOMINATED for best in show! 15.5.2011 Mimmi SUPREME CHAMPION!! + NOMINATED for best in show! 15.5.2011 Ilona NOMINATED for best in show! 14.5.2011 Mimmi Best In Variety! 14.5.2011 Ilona International Champion + NOMINATED for best in show! Both days Ilona Best in variety and BEST IN SHOW adult female!! Also Mimmi Best breeding feemale in category 2 both days! And Lulu NOMINATED for best in show on Sunday, and she got 2 votes (winner gor 3)! 22.4.2011 Cindy has 5 kitten! 3.4.2011 Sanni has 5 kitten! 26.3.2011 Juuli has 5 kitten! New girl S*Gunbertus Peach Puff ~Puffy~ has arrived :) Thank you Ulla! 29.1.2011 Melli's 1st litter 4y!! 27.1.2011 Dollyblues vol 2 litter 3 y!! 1.1.11 Melli's 2nd litter = Dollyblues vol 1 litter 3 years!! 26.12.10 Mimmi's first litter 2y!! 28.11.10 Mimmi's 2nd litter 1y!! Ada got certificates bothd days and graduated as Champion :) Cindy attended only on Sunday and got her certificate. Kittens Ex1-Ex2. My Swedish princess "Elli" has arrived - thank you Maria for trusting me! Sanni graduated as Grand International Champion on Saturday, Cindy and Enya got certificates both days and Cindy was NOMINATED both days :) Kittens Ex1-Ex2. Finally, Mimmi&Jape got 6 kittens :) More on babyblues -page. 27.8.2010 Mimmi is "really pregnant"
Yes we knew she was, she is already huge, but we didn't assume there could be so many embryos (we found 5 from other horn and stopped the counting) - we'll see how many will born. How weird being in a cat show without "own" cat! That's the result of having so many cats living in foster homes... Both girls Enya&Cindy EX1 on both days. Kittens of Sissi&Namu have born! Kittens of Ada&Namu have born! Ukko got approval for breeding on Saturday! Typy&Hupu&Cindy EX1 both days. Mimmi best breeding female in kat. 2 on Saturday. Sanni gave birth to 5 kittens! It was a long day, but seems mum & babies are doing well. Typy also nominated for best in show on Saturday and Mimmi got her certificates both days, so all in all a great weekend! Typy and Cindy BIV both days, Typy NOM on Sunday and Cindy on Saturday :) Juuli Ex2 and Hupu Ex1 both days. Ada's ultrasound check confirmed my diagnosis, 5-6 kittens should be born at week 23 if everything goes well. 10.5.2010 Sanni's first litter 1 year!! On my way back home I visited Ada, and it seems Namu will become father :) Ada's due date is at week 23. Ultrasound check showed atleast 5 kittens! Kittens should be born around May 31st. Juuli was EX2 in her first show, but Mimmi suprised and received certificates both days. Mortti, the "little" huggie bear, again BEST MITTED NEUTER MALE! I've received a cutest lil' princess ~Siru~ from my dearest friend - thanks a million Riikka! 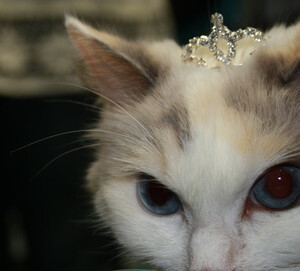 After a long search from abroad, I found my new queen very near: Juuli is from FIN*Damuran -cattery. Both parents are imported so her lines provide me new opportunities. Thank you Sari for trusting me! 29.1.2010 Melli's first litter 3 years!! 27.1.2010 Dollyblues vol 2 littert 2 years!! 1.1.2010 Melli's 2nd litter = Dollyblues vol 1 litter 2 years!! 26.12.2009 Mimmi's first litter 1 year!! Mortti's daughter Siiri has become a mother! Congrats to Safireye's -cattery! We have wonderful news from Turok cat show: my precious huggiebear Mortti, Dollicious Padrone del Aqua, graduated as Supreme Premior!!! Special thanks to breeder for this wonderful boy! On Saturday Peikko was best in variety! Sissi, Sanni and Mortti got certificates both days and on Saturday Sissi was BIV and on Sunday Mortti was nominated for best in show!! Ultrasound check showed 3-4 kittens, so maybe now I can believe it!!! All the signs were in place but after waiting sooo long, I just couldn't believe it - I'm soooo happy ;') Kittens should be born on 28th November. Fist show for Sanni's kittens Ada, Peikko&Huuru went nicely: all behaved and presented theirselves well, and Huuru was nominated on Saturday! Mortti ja Sanni got certificates both days, and Sanni was best breeding female in kategory on Saturday! Mortti got certificates both days, and was also NOMINATED on Saturday!!! Best of all, I was able to enjoy the show and company! Mortti got certificates on both days, and graduted as Grand International Premior on Saturday!!! I was working the whole weekend and couldn't enjoy the show - thanks a million Riikka, Katja, Niina & Annukka for taking care of Mortti! Our new studboy has arrived to Finland on July 17th! More on Boys -page. 2.7.2009 We have a new kitten!!! 13.&14.6.2009 Mimmi graduated as IC!! Mimmi travelled to a cat show in Latvia and graduated as International Champion! Mortti got certificates both days, and was also NOMINATED on Saturday! On Sunday the grandmother of Sanni's kittens, Elmeri's mother, GIP&EC Panacheen Zealous Zulu was BEST IN SHOW, neutered female!!! Congratulations Viivi&Annukka!!! Ultrasound check showed Sissi is pregnant but there seems to be only one baby :o The due date for the kitten is on July 2nd. Melli is nowadays neutered lady. Sissi and Mortti got their certificates, and Mortti was also NOMINATED on Saturday! Great thanks to Melli's breeder for this wonderful cat! Sissi and Mortti got their certificates, and my little girl Sissi was also BIV and NOMINATED on Saturday! Ultrasound check showed 4 kittens!!! The due date for the kittens of Sannin and Elmerin is on Mothers' Day. Ida ~ Dollyblues Rainbow Doll ~ has got kittens! All the best for mum&babies and for Annukka&Jussi! Lilli (Tiridoll's Pretty Lady, RAG a), my first and the queen of our house, is 7 years old! Without Lilli there wouldn't be any other, so special thanks to Outi for this precious girl! My little girl, Sissi: BEST MITTED FEMALE! My "little" huggie bear, Mortti: BEST MITTED NEUTER MALE! Older news only on Finnish -pages.